CLUB MED KANI vs. CLUB MED FINOLHU VILLAS, WHICH WAS BETTER? Club Med offers all-inclusive luxury resorts all over the world. These resorts are great for family or couple getaways. Mike and I have had the opportunity to check out a few Club Med’s now, and we have to say we kind of fell in love with the idea of all-inclusive resorts. Why? Because there’s no hidden fees and you don’t need to worry about paying any bills at the end of your stay (unless you paid for an extra excursion). While we were in the Maldives, we were able to experience both Club Med resorts Kani and Finolhu Villas. 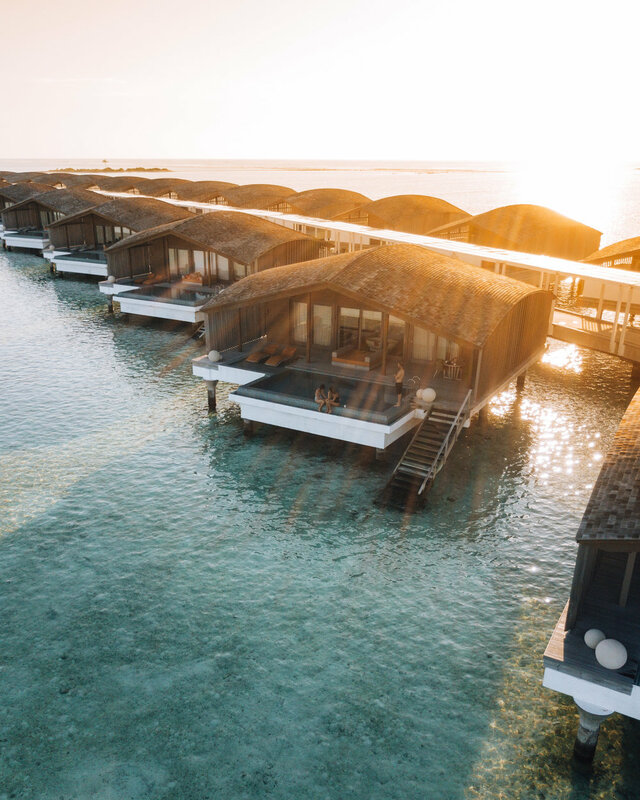 If you are thinking of planning a trip to the Maldives and are interested in Club Med, here are a few differences to keep in mind before you decide on which resort to stay at. Right off the bat, Finolhu Villas is tailored more to honeymooners and Kani was designed more for families. A lot of the differences in this article have a lot to do with that alone. One of the biggest differences you’ll find is that Finolhu Villas is A LOT quieter than Kani. If you are on your honeymoon and want something peaceful and quiet then, Finolhu Villas is perfect! Kani is more for families so you’ll hear lots of music, kids playing and activities happening regularly. If you’ve never been to the Maldives before, transportation options are by boat or sea plane because each resort takes up their own island. For both Club Meds, you’ll be transferred by boat and it takes about 30 minutes from the airport to the island. Once you land at the airport, your resort will organize transportation for you so you don’t need to worry. One of the great things we found out when checking into Kani, was that we could take a boat to Finolhu Villas for the day - only a 6-minute boat trip away. If you are checked in at Finolhu Villas, you have full access to Kani with scheduled transfers there and back throughout the day. Where Kani is family oriented, Finolhu Villas is adults only so no kids will be allowed to visit, from Kani either. Finolhu Villas really wants to keep the atmosphere quiet and peaceful for honeymooners who enjoy that kind of environment. There are so many activities you can do at both resorts and they happen all day! At Kani we checked out the colour party on the beach! We also attended a glow party; where we had our faces painted with glow in the dark paint and partied under the blue lights. We attended white night at both resorts Kani was a much larger affair where Finolhu was quieter and more of a date night atmosphere. There’s also snorkelling, scuba diving, hover boarding, trapezing, sailing, spa, fitness club, etc. There are so many things you can do on the island. At Finolhu Villas we did a snorkeling trip for about 1.5 hours and saw turtles… I almost cried. Finolhu Villas had a smaller selection of dishes but really quality. In the buffet, dishes at Finolhu are plated by the chefs. At Kani, you have the freedom to create your own plate with a much larger selection. Both resorts do cater to different cuisines so there was italian, indian, Japanese, etc. All prices below are based on 7 nights for 2 people leaving from Montreal, Canada. Prices vary depending on high or low season and whether you are choosing a beach villa or water villa. Prices are in Canadian dollars. Kani: Prices range from $3,000 to $11,000CAD for 7 nights for 2 people with flights included. January - April are the best months to go and it’s about $3000-$4000CAD for the week. December is the most expensive at $11,000CAD. These prices are based on a beachfront villa. Finolhu Villas: Water villas are between $18,000-$20,000 CAD and the beach villas are about 15,000CAD. Both of our accommodations were over water villas and they were beautiful! The villa we had at Finolhu Villas was a lot bigger than Kani and a little bit more luxurious looking but honestly we really liked them both. We liked that Finolhu Villas had a private pool at every water villa, at Kani we didn’t have a private pool so we would have to go to the main pool. For both resorts, the beds were really comfortable, the cleanliness was great and both had balconies. There were also WAY more water villas at Kani than there were at Finolhu Villas. When we got to Finolhu Villas we were joined by my best friend Lisa (@lisahomsy) and James (@jamesdcrowe_). We were neighbours for 4 days and it was so nice to share a trip like this with them. We all had a blast together! The service at both resorts was great. The difference? Finolhu Villas gives you a butler for your stay. If we wanted to organize transport around the resort or needed anything we could call our butler Calvien and he would help us out. He was great and really took care of us during our stay. Kani was really able to create a sense of community amongst their guest which was really cool to see. If we were in need of anything special we could ask either the front desk or a manager and they would help us out. I also really liked that Kani had a couple of nurses and doctors available. I’m sure it would be the same at Finolhu Villas but I wasn’t in need of any medical attention there. With my luck I usually have something happen to me on every trip. This time I got a massive splinter in my foot. Note: Wear flip flops on boardwalks. Mike tried to get it out but it just didn’t want to. I went to see the nurse who got it out in 10 seconds and on a side-note it was so satisfying! WHICH ONE DID WE PREFER? Each resort truly caters to 2 separate groups. Finolhu Villas for relaxing honeymooners and Kani for either the honeymooners or families. If we were to do it all over again and only stay at one resort we would probably go back to Kani. Why? Because we found FInolhu Villas a little too quiet for us. With Kani you can still have quiet time in certain areas and we really liked the vibrant atmosphere. What we did love about Finolhu Villas is the service was really luxurious with having a butler to help you with anything you needed. However Mike and I are really hands on so we didn’t feel like the butler was entirely necessary for us on this trip.